A network is anything where different computers are connected to another. Whether that is a shared drive on a workstation, a server in an office, or a stand-alone storage solution (Network Attached Storage, NAS): Network backups are very popular! A network solution has many advantages for the user: The data is safe because of physical separation; the central storage of data on a secure medium and the minimal administration requirements. Practice has shown that errors in the wiring which don't stand out during daily operation are the most common cause for failures in a network backup. If you have chosen to do network backups, you should check the existing hardware/wiring carefully and replace old (slow) components. In case you need new components, you should refrain from buying cheap noname products on eBay, because the excitement about a low price will certainly change to a sobering disappointment when it turns out that the new hub/switch from an exotic far-eastern manufacturer or the cheap and buggy NAS are completely unsuitable for a reliable and fast network backup environment. 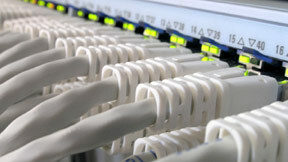 As with mediums, the network hardware should be quality products of well-known manufacturers. Your backups are worth the (generally small) additional charge! Hard disks that serve more than one computer via a network interface are no longer an issue for experts only. Their prices get nearer to normal external hard drives and they are very convenient for network backups. However, as usual, not all that glitters is gold: The cheap entry-level products for small and home office (SoHo) could not convince me. If you are thinking about a periodical backups in the range of several GB, you should spend a little more on a professional device. I can recommend the Synology Disk Station 101j (ca. 150 € without hard disk) and the Iomega StorCenter (ca. 250 € with a 250 GB hard disk). The important options are activated with the setting Network Backup. Additionally, the performance and data throughput can be adjusted to the conditions of the local network. If the Network Backup Option is activated in Z-DBackup, but Z-VSScopy is not installed, then files which are exclusively opened by other applications (file lock) are recognized during the backup and skipped with a corresponding entry in the log file. The option Network Backup is also perfectly suitable for backups to external USB hard disks, as long as no multi-spanning is needed! With the option Network Backup, Z-DBackup needs on average about 1:45 hours for backing up 21 GB to a NAS (Synology DS101) in a 100 Mbit LAN. Seal away the backup mediums from the workstations and network as well as possible: Do not simply back up to a shared network resource, because there is a risk that you lose your backups because of a virus or an accidental wrong click. Instead, create a dedicated user account and leave it to Z-DBackup to establish a connection for the time of the backup and automatically disconnect afterwards. Always use the 256-bit AES encryption. And who would expect a NAS in a network cabinet? Z-DBackup is written by Andreas Baumann © 2001 - 2018.